Sygnia is a relative newcomer to ETF market, launching its own versions of the most popular funds and taking on the established players by undercutting them on costs. Its two top 40 ETFs, launched last month, will have the lowest total expense ratios in the market at 0.15%. The Sygnia Itrix Swix 40 ETF weights companies according to the market capitalisation of companies according to the shares held on the JSE register, which means dual-listed stocks – companies listed on the JSE but mostly traded on other markets – are held in a lower proportion. This index has become popular because it avoids some of the weightings anomalies of the older Top 40 Index, which has heavy weightings for foreign companies like Richemont and BHP Billiton. The Sygnia Itrix Top 40 ETF considers the market capitalisation of all companies listed on the JSE – but the caveat is that at least 1% of shares of a given company should be on the local register in order for a company to be considered as a constituent of any given index. As a consequence, these two funds have distinct sector weightings, as shown in the graph below. Suitability: Top 40 funds invest in the largest companies on the JSE, generally considered to be South Africa’s blue chip companies. These funds suit investors with a medium- to long-term investment horizon and can be used as part of a core investment portfolio. Equity investments tend to exhibit higher short-term volatility than other asset classes such as bonds and cash, so a longer investment horizon gives a portfolio time for returns to accumulate ahead of volatility. However, the Swix fund is more geared to South African investor because it reduces exposure to resource stocks, which tend to dominate general equity indices. Since mining forms a big part of SA’s economic value, having an investment portfolio with a lower exposure to resources makes for a more diversified portfolio. The Sygnia Itrix Swix 40 ETF tracks the FTSE/JSE Swix 40 Index by investing in the underlying index securities. 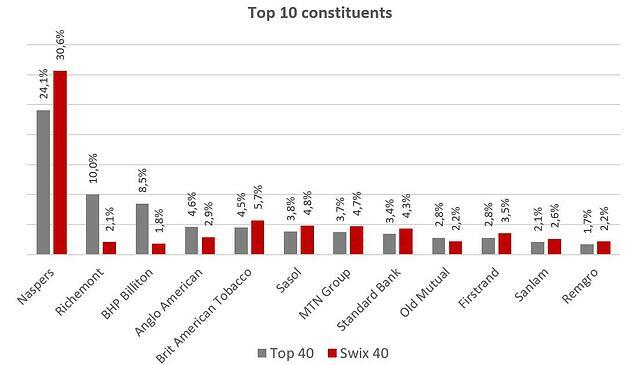 The FTSE/JSE Swix 40 Index consists of the largest 40 companies listed on the JSE, ranked and weighted by market capitalisation on the South African register. 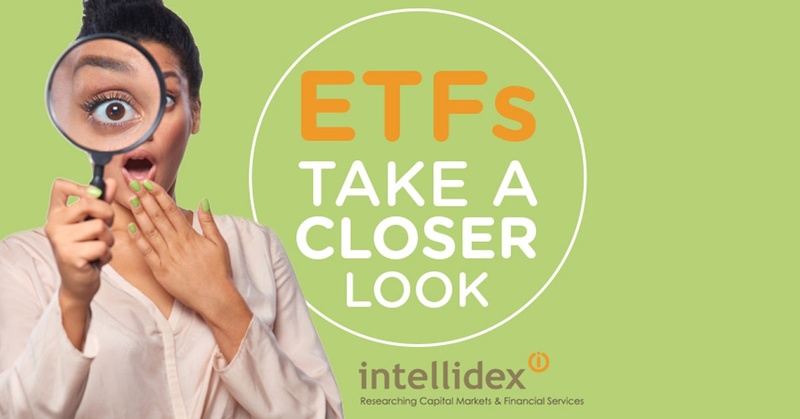 The Sygnia Itrix Top 40 ETF tracks the FTSE/JSE Top 40 Index by investing in the underlying index securities. The FTSE/JSE Top 40 Index consists of the largest 40 companies, listed on the JSE, ranked by investable market capitalisation in the all share index. Top holdings: Because of the differing methodologies, the Swix 40 fund has small stakes in Richemont and BHP Billiton, which make up a significant part of the top 40 fund’s holdings. Risk: This is a 100% investment in equities, which is a riskier asset class than bonds or cash, but the returns over time should compensate for volatility. Fees: Both ETFs have a targeted total expense ratio of 0.15%. If achieved they will be the cheapest top 40 funds on the market. Equities are driven by general economic activity and, over long periods, have proven their ability to provide investors with growth ahead of other investment classes. SA’s economic situation is dire, marked by a worrying budget deficit and an uncertain political environment. Exacerbating the situation are government’s debt guarantees to poorly performing state-owned enterprises. Credit rating agency S&P downgraded our local currency’s credit rating to junk, while Moody’s has put us on review for a downgrade. This is likely to raise general interest rates which will further dampen prospects for economic growth. On the upside, the significant foreign exposures in both of these funds benefit from rand weakness, and often involve regions where economic growth is faster than SA’s. There is another problematic issue. The resurgence of the JSE in the past few months has been driven primarily by Naspers, which derives most of its income from its stake in China’s Tencent internet company. This is masking the poor performance of the bulk of the JSE’s stocks. The implication is that it raises risk, particularly for index investors, because of the lack of diversification on the local bourse. The recent Steinhoff debacle demonstrates the importance if a well-diversified fund. Both the Swix and standard funds have significant exposure to Naspers, with the Swix fund having the larger weighting at 30.6%. While the good performance of Naspers has meant that funds with large weightings have outperformed, the concentration risk is a matter of significant concern. The standard Top 40 fund, which weights Naspers at 24.1%, provides better diversification, but even that weighting is larger than we’d normally be comfortable with. An alternative fund that eliminates the concentration exposure problem with Naspers is the CoreShares Top 40 Equally Weighted ETF (total expense ratio: 0.29%). This fund invests in the top 40 companies in equal proportions of 2.5% each.